The 3206 Series Servo Gearbox takes a Hitec HS-788HB servo and converts it into the monster servo it has long dreamt about being. 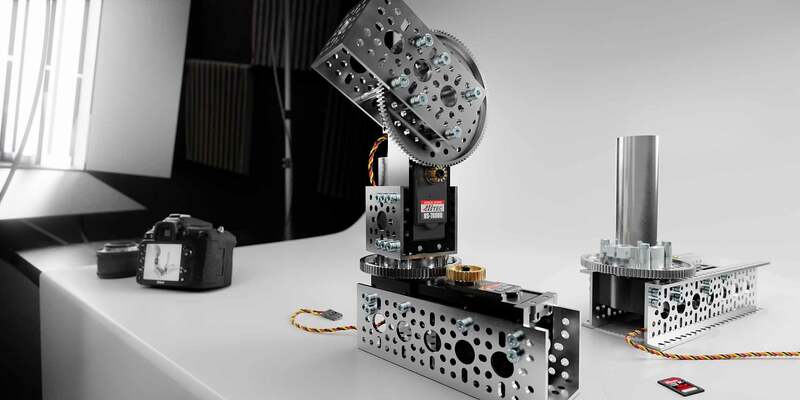 The all aluminum framework acts as a servo mount, an exoskeleton and a pillow block all in one. The 32mm output tube is housed in a pair of bearings to allow for smooth rotation while isolating axial loading from the spline of the servo. The gear ratio between the servo creates the trade-off between rotation and torque. The HS-788HB is an eight turn servo right out of the box. By gearing the servo down it multiplies the torque at the final shaft so that the servo can be used in much more demanding applications. The clamping hub on the top of the shaft provides M4 threaded holes to fasten components to. The large center bore is a portal that can be used to run cables, wiring, shafting etc. through so that they don’t tangle or limit the rotation of the final gear.